The 6 iron chip shot is an extension of putting. It is designed for use when the ball is just off the green and you need just enough lift to get the ball on the green and rolling. Use the same grip and technique as you would with a putter with the ball farther back in your stance. 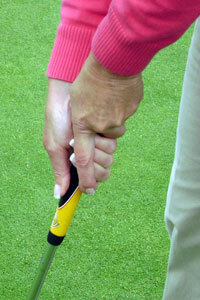 (The most common putting grip is the reverse overlap. Put the index finger of the left hand on the outside helps to keep the left wrist firm throughout the stroke). Address the ball with the club head on the toe which will necessitate moving the hands down the shaft in order to maintain a comfortable putting position. Hitting the ball off the toe deadens the shot and leaves less room for error as the head of the club can’t get caught in the grass. 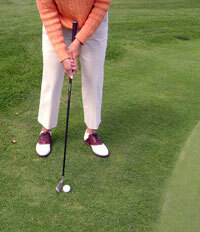 Stroke the ball with your shoulders and arms the same as you would a putter. With a little practice this shot can become very valuable. You can also experiment with other clubs using the same technique. The more lofted clubs will produce less roll and conversely the less lofted clubs will produce more roll for longer distances. No need worry about hitting it thin over the green with this shot, you are just putting.